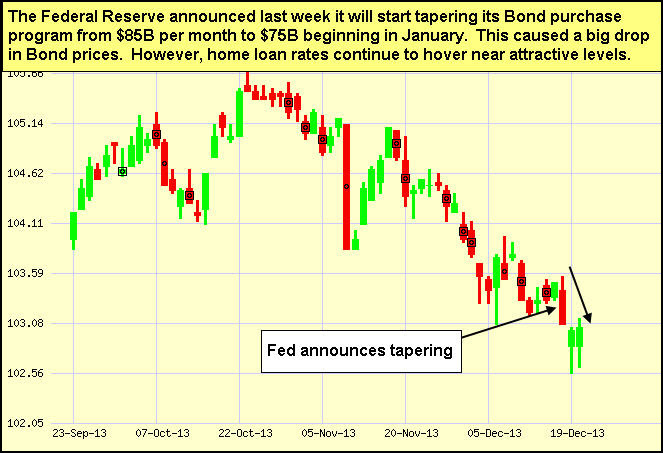 Last Week in Review: The Fed announced that it will begin tapering its Bond purchase program. Plus, important news about housing and the economy. Forecast for the Week: During the holiday-shortened week, look for news on consumer spending, housing, inflation and jobless claims. View: Check out some of the top business books from 2013 for great tips and ideas for your business. Ready. Set. Go. Last week the Fed announced that it will begin tapering its Bond purchase program by $10 billion per month. Read on to learn what this means. Remember that the Fed has been purchasing $85 billion in Bonds and Treasuries each month to stimulate the economy and housing market. Moving forward, the Fed will now purchase $40 billion in Treasuries and $35 billion in Mortgage Bonds (the type of Bonds on which home loan rates are based). The Fed's decision surprised the markets and caused Bonds and home loan rates to worsen on the news. In his speech after the Federal Open Market Committee meeting, outgoing Fed Chairman Ben Bernanke noted that the tapering process will continue to be dependent on economic data. This process could continue to have a big impact on Mortgage Bonds and home loan rates heading in 2014, and it will be an important story to monitor. Over in the housing market, Housing Starts for November soared by 22.7 percent from October to 1.09 million units annually. This was the largest percentage increase since January 1990 and the biggest rate in five years. Building Permits did decline by 3.1 percent but came in above expectations, while Existing Home Sales fell year-over-year in the month ended in November for the first time in 29 months. Overall, the housing market continues to see improvement, and this likely contributed to the Fed's decision to begin tapering its Bond purchases. As usual, Thursday brings Weekly Initial Jobless Claims and comes after last week's big spike in claims to 379,000, which was the highest level since March. The Bond markets will close early on Tuesday, Christmas Eve, at 2:00 p.m. ET, with Stock markets closing at 1:00 p.m. ET. All markets will be closed on Wednesday in observance of Christmas. As you can see in the chart below, Mortgage Bonds worsened after the Fed announced that it will begin tapering its Bond purchase program. However, home loan rates remain at attractive levels and I will continue to monitor this closely. Top 5 Business Books of 2013 This year's Amazon Best Sellers in Business were a cross-section of great ideas from every corner of the working world, running the gamut from sports leadership, to marketing, to the changing business climates of today. If you're in business to stay in business, take a tip from the top five books (and explore the other 15 on this great list) and get inspired for 2014.#5. Contagious: Why Things Catch On. Wharton marketing professor Jonah Berger has spent the last decade answering the question, "What makes things popular?" Most people think advertising. Not so, according to Berger, it's word of mouth. The trick is how to boost awareness without coming off as self-serving. Whether you need to spark something viral with a product, a person, or an idea, look no further than Contagious. #4. Eleven Rings: The Soul of Success. Head coach of the Chicago Bulls and Los Angeles Lakers, Phil Jackson has won more championships than any coach in the history of professional sports. More importantly, according to Eleven Rings, he coached from a place of deep values. Being tagged as the "Zen master" coach, he developed a new approach to leadership based on freedom, authenticity, and selfless teamwork. Unique in the ultra-competitive world of professional sports, this method is equally needed in the business world today. #3. Playing to Win: How Strategy Really Works. A.G. Lafley, CEO of Procter & Gamble, co-authors with strategic adviser Roger L. Martin to outline the strategy P&G used to double sales, quadruple profits, and increase market value by more than $100 billion during Lafley's tenure between 2000-2009. Leaders in any organization will learn the essential elements for business success: where to play and how to win, while implementing five essential strategic choices. The ideas in this book can help you turn a brand around or make a great one even better. #2. Give and Take: A Revolutionary Approach to Success. Wharton's youngest tenured professor, Adam Grant, Ph.D., reveals his pioneering research on how focus on the traditional "indicators" of success like passion, hard work, talent, and luck don't play the role we once thought. Grant shows how three interaction styles in the office have a surprising impact on success. Praised by bestselling authors such as Dan Pink, Robert Cialdini, Seth Godin, and more, Give and Take promises an approach to success that could transform any organization. #1. Lean In: Women, Work, and the Will to Lead. Sheryl Sandberg, CEO of Facebook, is ranked on Fortune's list of the 50 Most Powerful Women in Business and Time's 100 Most Influential People in the World. Lean In expands on her now famous TEDTalk (viewed over 2 million times) where she described how women unintentionally hold themselves back, and offers solutions to empower women to achieve their full potential. Called an "inspiring call to action and a blueprint for individual growth," Lean In is an important conversation-changer for women in business.